With only three episodes left, The Vampire Diaries has three goals: keep us interested, raise the stakes, and still give us some pleasant nostalgia. They aced the third item this week with the reintroduction of a fun new villain and a few long-missed pairings. 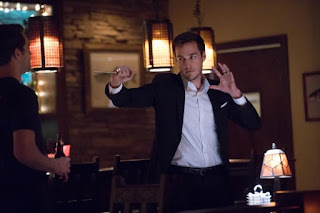 Like Alaric and Damon, who sort of teamed up again this week. Sure, Alaric still has some Damon issues (who doesn’t? ), but it was nice to see those former besties working together, however briefly. Perhaps that’s part of why Alaric also reunited with Caroline: affection for lost friends. Of course, the obvious reason is that their daughters are out of control of their powers and wildly short-tempered. Is it because they’re four years old, or because they’re mystically connected to Kai? We have no way of knowing, but it’s probably not the first one. Alaric and Caroline has always been an ambiguous pairing. I think I like it more than most because I’m old enough and bitter enough to believe that a compromise relationship based on shared values and compatibility is a goal rather than a let-down. Since Caroline and Stefan are currently, again, on the rocks, I’m rooting for Calaric again. After all, Stefan has some baggage to deal with. Neatly personified by Dorian, the man previously known in these reviews as “Intern,” Stefan’s past came back to haunt him. Or, rather, to kidnap him, make him dig his own grave, and shoot him in the stomach in what was probably an unintentional homage to a key moment in Lost. The conversation between Dorian and Stefan was well done, although your tolerance for Stefan’s self-defense likely depends on whether you view yourself as in a process of redemption or the victim of a villain. But it’s not like we should expect Stefan to off himself or go straight to hell or refuse to do anything out of guilt. That is not productive, and certainly not good TV. Bonnie is good TV. Her grief created a “private dimension.” Cade claims that she was the first person to do so since him, but Bonnie’s dimension seems nicer. And smaller: a single-room occupancy for Enzo. I’m rooting for those two kids still. In fact, I care about them more than any other couple on this show right now, because Bonnie deserves something good. Bonnie’s conversation with Cade was quite revealing. Cade said that he is “as much a part of [his] psychic dimension as it is of [him].” So killing Cade destroys Hell, right? Years ago, tearing down the Other Side had some interesting consequences. Can you even imagine what delights might occur if they emptied Hell of all its occupants? The guest-stars alone, and the carnage…yum. It’s a good plan, and one that I assume is in the works, because Kai—while amusing—actually had nothing to offer this week. He told Alaric and Damon to let him live so he could help defeat Cade, but that Kai is all hat, no cattle. And now he’s in possession of Elena, thanks to the Gemini Coven go-to “invisique” spell that makes me laugh every single time. That’s good set-up. And with three episodes left, we know they’re heading somewhere. • CobraKai 1972 is Kai’s Twitter handle. • Were the sirens hot? “Sure,” says Damon. “If you’re into cannibal divas.” And Kai probably is. Two and a half out of four cannibal divas. Felt like the final transitional episode before the big ending. Everything is in place, we know the Devil is not unique in his powers, we know that you can escape hell, we have Kai in possesion of Elena's coffin to bring back Nina Dobrev. Now the only thing remaining is keeping fingers crossed for a good ending.